My latest little web project is a fairly simple, one-page photo gallery which I created as a surprise for Velma's birthday, which is today (happy birthday, V!). She's very hard to buy gifts for. She eschews material things, so I have to be creative when it comes to gifts. To top it off, she's about 1,000 miles that-a-way right now, which makes celebrating her birthday in person out of the question. At least until Friday night when I arrive in Missourri. So I came up with this little gallery idea. Interestingly, it's almost becoming a tradition for me to do something for her website. Last year I turned her static website -- which I never had time to update for her -- into a Blogger-powered site, so she can update it herself whenever she wants. 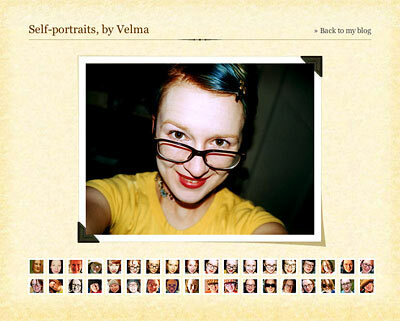 Velma's been taking self-portraits for years, so it makes for a wonderfully interesting album of pictures over time. It really shows a lot of faces of that cute redhead Ilike to hang out with. "She's very chameleon-like," said Jason when I showed it to him. I want to start doing a better job of keeping notes on how much time it takes to make these sorts of side projects (I rarely bother to keep track when it's not a paid job and I'm therefore not billing someone), and I thought aspiring web designers might find my description of the process useful, so here's a brief synopsis of how I put it together. 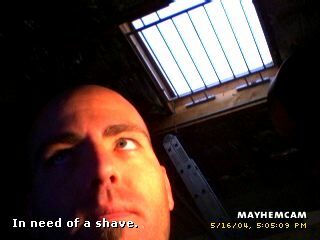 On Monday night, after work, I slid my portable Canon scanner, which I like a lot, into my backpack with my laptop and headed over to a nearby caf�, and sat down with a large mocha to scan 36 photos. I had borrowed the pictures several months ago from Velma, telling her I'd like to scan them at some point when I had time. Since she knows me so well, she probably thought it would happen about the time hell froze over. Placing 4 pictures on the scanner at a time, careful to keep them in order, I scanned them all at high resolution (600 dpi at 1:1), knowing that I might want to use them in larger versions at some future point. However, the versions for this project would be sampled down to 400 x 300 pixels. I spent Tuesday, Wednesday, and a part of Thursday night designing the template in Photoshop, then imaging all the scans. The design is based on Velma's blog template, which is a variation on a standard Blogger template that I had tweaked the colors and spacing on until I liked it better. The high res photos had to be separated (from 4 to 1), cropped, and then laboriously color-corrected (some of the prints had horrible color casts). Then there was retouching, sharpening, and placing all 36 images into the template I'd designed. Then I had to make smaller versions for the tiny thumbnails.